HIGHDEF® yellow IHC chromogen (HRP) is intended to be used in conjunction with horseradish peroxidase (HRP)-based immunostaining or in situ hybridization systems. With at least 1 day working stability, this substrate/chromogen system can be used in any automation system as well as manual use. Multiplex IHC staining performed on formalin-fixed paraffin-embedded human tonsil stained with CD8 antibody labeled with HIGHDEF® black IHC chromogen (HRP) (Prod. Ref. ADI-950-171), CD68 antibody labeled with HIGHDEF® yellow IHC chromogen (HRP) (Prod. Ref. ADI-950-170), CD163 antibody labeled with HIGHDEF® green AP chromogen/substrate (Prod. Ref. ENZ-ACC130), and hematoxylin counterstain. Image used with permission from Plateforme de Pathologie Expérimentale et Translationnelle - PETRA, Unité AMMICa, Gustave Roussy Cancer Campus, Villejuif, France. Multiplex IHC staining performed on formalin-fixed paraffin-embedded human tonsil stained with FOXP3 antibody labeled with HIGHDEF® black IHC chromogen (HRP) (Prod. Ref. ADI-950-171), CD3 antibody labeled with HIGHDEF® yellow IHC chromogen (HRP) (Prod. Ref. ADI-950-170), CD8 antibody labeled with HIGHDEF® green AP chromogen/substrate (Prod. Ref. ENZ-ACC130), and hematoxylin counterstain. Image used with permission from Plateforme de Pathologie Expérimentale et Translationnelle - PETRA, Unité AMMICa, Gustave Roussy Cancer Campus, Villejuif, France. Immunohistochemistry analysis: Formalin fixed paraffin embedded human tonsil stained with a high molecular weight CK antibody labeled with HIGHDEF® yellow IHC chromogen (HRP) (Prod. no. ADI-950-170) produces a distinct golden yellow color. Immunohistochemical analysis: Formalin fixed paraffin embedded human tonsil double stained using MULTIVIEW® (mouse-HRP/rabbit-AP) IHC kit (Prod. no. ADI-950-100). Primary rabbit anti-Ki67 antibody was visualized with HIGHDEF® red IHC chromogen (AP) (Prod. no. ADI-950-140), while primary mouse anti-HMW CK antibody was visualized with HIGHDEF® yellow IHC chromogen (HRP) (Prod. no. ADI-950-170, sold separately), producing a distinct golden yellow color contrasting with the bright red. Formalin-fixed paraffin-embedded human tonsil stained with pre-diluted mouse CD68 antibody labeled with HIGHDEF® IHC chromogen substrate (DAB, HC) (Prod. no. ADI-950-211, brown), pre-diluted rabbit lambda light-chain antibody labeled with HIGHDEF® blue IHC chromogen (AP) (Prod. no. ADI-950-150, blue), pre-diluted rabbit kappa light-chain antibody labeled with HIGHDEF® red IHC chromogen (AP, plus) (Prod. no. ADI-950-141, red), high molecular weight cytokeratin labeled with HIGHDEF® yellow IHC chromogen (HRP) (Prod. no. ADI-950-170, yellow), and methyl green nuclear counterstain. 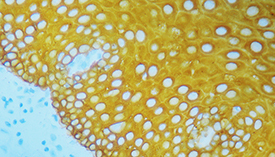 Technical Info/Product Notes: The HIGHDEF® yellow IHC chromogen (HRP) is a substrate-chromogen system designed to be used for either IHC or ISH when utilizing horseradish peroxidase. It produces a distinct bright yellow that can easily be distinguished from other stains. High definition IHC chromogen producing brilliant red color for AP-activated development in automated and manual systems.